Lundqvist's spot atop the Vezina Trophy race is aided in part by the lower-body injury that kept preseason favorite and reigning winner Carey Price out of action for nine games, but even a healthy Price would have had a hard time staying ahead the way Lundqvist has played through the first six-plus weeks of the regular season. So what has changed for Lundqvist this season compared to the past few, when he didn't seem to find his top form until sometime in December? In addition to altering the preseason focus with an eye toward a better start, Lundqvist has talked about the benefit of new skates that allow him to more easily grab an edge from his low, wide stance. But the bigger difference, apart from what he's described as a more relaxed mindset, may be where those skates are taking him. Long known for deeper positioning and a goal line-out approach, Lundqvist has been spotted well beyond the edges of his crease more often to start the season, whether it's taking ice early and retreating with an odd-man rush, or charging out harder from the blue ice when he reads an open look. Although that has at times left him diving back across the crease Superman-style on a handful of highlight-reel saves, Lundqvist believes he's better for it. 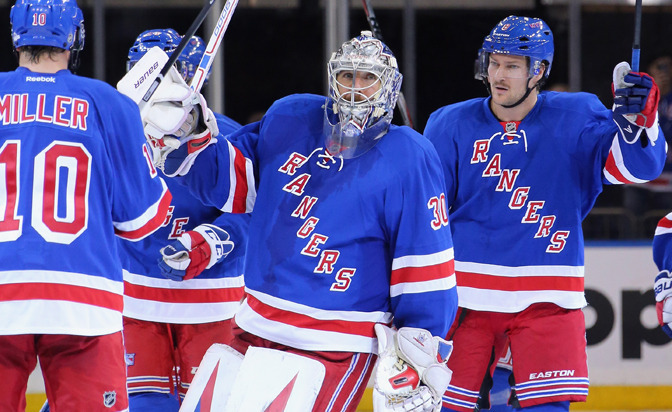 "I think a lot of it is just trusting your instincts," Lundqvist told the New York Daily News after the game Monday. "If you look at my game this year, I'm challenging a little bit more, trusting my instincts, and we talked about going into this season to be a bit more aggressive. Just mentally I feel I'm way more relaxed, my focus." Carey Price, Montreal Canadiens: Despite missing three weeks, Price remains in the top 10 in the NHL in wins, with 10 in 12 games. Although the rest of his numbers dipped slightly when he allowed nine goals in his final two starts before sitting out to get the injury evaluated and treated, Price's dominance out of the gate and standing as a perfect example of a "how-to goalie" makes him a strong contender to add to an end-of-season trophy collection that also includes last season's Hart Trophy as the NHL's most valuable player and Ted Lindsay Award as the best player as selected by his peers. Price's adjusted 5-on-5 save percentage of .935 is slightly better than his .934 total, but the numbers are close enough it may be time to put to bed the myth the Canadiens are nothing more than their goaltender; that doesn't change Price's status as one of the League's best. James Reimer, Toronto Maple Leafs: Reimer's rise to fourth place in the NHL with a .934 save percentage has been fueled by a relatively short stint as the Maple Leafs' No. 1 goaltender, and staying in the top three of this race will require a much longer run behind Toronto's improved defensive structure, but the oft-criticized goalie also deserves some credit for his resurgence. From Reimer's offseason work learning head trajectory and improving his tracking in Kelowna, to key positioning and game preparation adjustments made by new Maple Leafs goaltending coach Steve Briere, the goalie nicknamed "Optimus Reim" has transformed his play this season.